I totally amuse myself because it is freezing in Florida. Yes, freezing! Albeit that the silly Northerners are running around in shorts like crazy people flirting with the flu, but I know better, so I bundle up all nice and warm. I might look a little funny because I am wearing a short sleeve shirt with gloves, but dang it my hands just get cold when I walk. I usually wake up at 6 am or so and walk around my neighborhood before the kids get up. It is really cold then, so cold that it hurts my hands. So I carry around my warmed coffee mug in my gloved hands. I have found three great reasons why I need to wear gloves. Warmth – This is obvious right? Static Electricity – I cannot stand the constant shocks I receive from touching car doors and metal. With gloves, I don’t feel the shock! Messes – The kids sticky messes don’t affect me and I can brush them off easily with a gloved hand. It tends to be a bit trying when looking for the best gloves for cold weather. The bitter air of winter is right around the corner and that means dry skin is going to fall right behind it. Most of the time, the hands are the last to be covered or even cared about. The jacket and beanie take precedence over everything else when stepping outside. It is time to change that stereotype and start making hands number one with Grandoe’s Homespun Gloves featuring their aloe treated snowfleece lining to soften your hands. What an innovative treat this is! After slipping on a pair of these bad boys, dry and cracking hands will quickly be forgotten. Another advantage these gloves have over the rest is the extra length to confirm more coverage and protection for the skin. The lining, which is made of polyester, is extended as well in order to create snug little cuffs for extra security. These are perfect to take on any snow adventure because their micro suede palms are water resistant, giving more time to play in the snow. Protection and snow adventures are only a couple of the great things Homespun has to offer. They come in four fun and funky patterns: Moose Tracks, Snowflake, Rainbow, and Lavender. 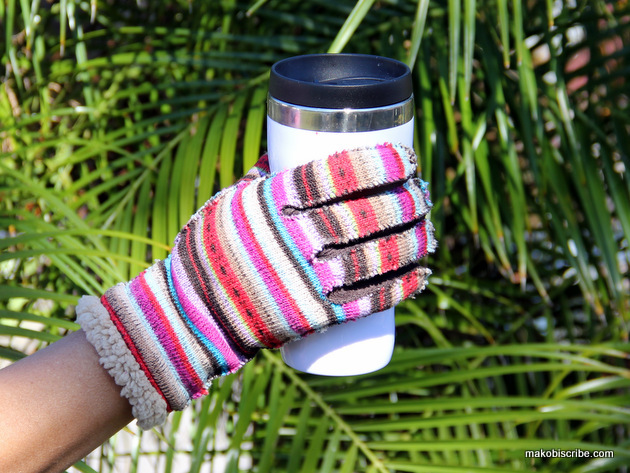 They even created the Homespun Flip Mitt, made with a micro fleece cuff and soft fleece lining, making it easier to build a fire or sip hot cocoa. Another great addition is the Homespun Cozee, which has whip stitch detailing giving the style a more homier feel and making these the best gloves for cold weather. All of these amazing gloves are available for only $35 running in sizes small to extra large. Grandoe, a fifth generation glove maker, has had almost a century to perfect their gloves, currently achieving the title of being the leading producer of innovative and high quality products. They now have patented and patent pending comfort technologies in the works for foot and glove wear. When do you wear gloves? this silly Northerner is laughing right now just wondering how cold it is in Florida 😀 It’s all relative, but I’m in Wisconsin. Talk about cold! I have circulation issues so I sometimes have to wear gloves year round, especially when carrying milk from the store for example. the only time I wear gloves are if I’m sticking my hands in snow, or when first getting in the car and the steering wheel feels like ice.